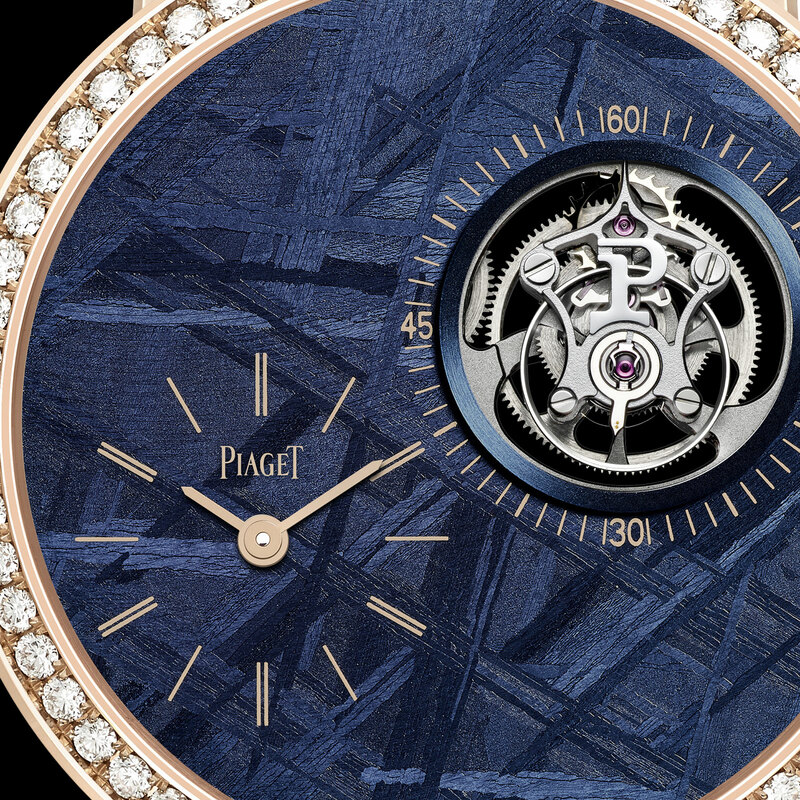 Typically sleek and simple, Piaget’s Altiplano line of ultra-thin watches is often dressed up with unusual dials, sometimes in semi-precious stone, and for SIHH 2019, coloured meteorite. The meteorite used for watch dials is of the iron variety, made up most of iron and nickel. It’s grey in its natural state, with a distinctive, streaky Widmanstätten pattern created by the nickel-iron crystals inside. Iron meteorite is usually etched with acid to bring out the definition of the Widmanstätten pattern, and can also be coloured, which is what Piaget has done. 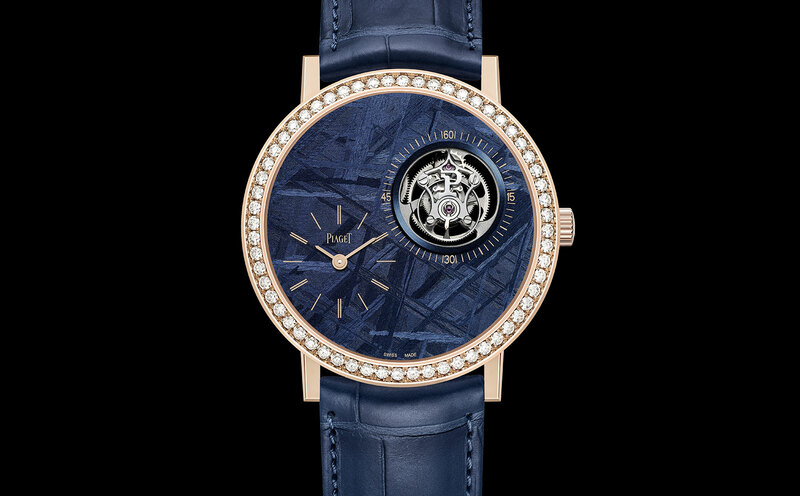 The Altiplano Tourbillon gets a dial made of blue meteorite with the markings done in gold print. 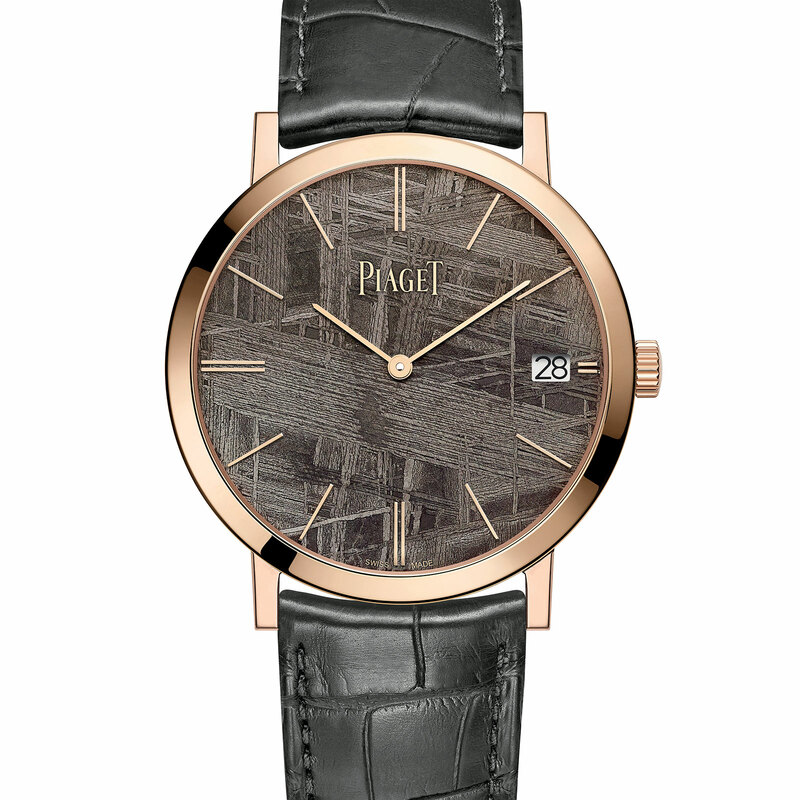 Set with diamonds on the bezel, the case is 18k pink gold and 41mm in diameter. Inside is the hand-wound cal. 670P, a movement just 4.6mm thick that has a flying tourbillon regulator along with an off-centre time display. The unusual layout of the dial is a consequence of the movement’s slimness, as the movement is constructed with the various parts spread out on the same plane, instead of upwards as in conventional movements. 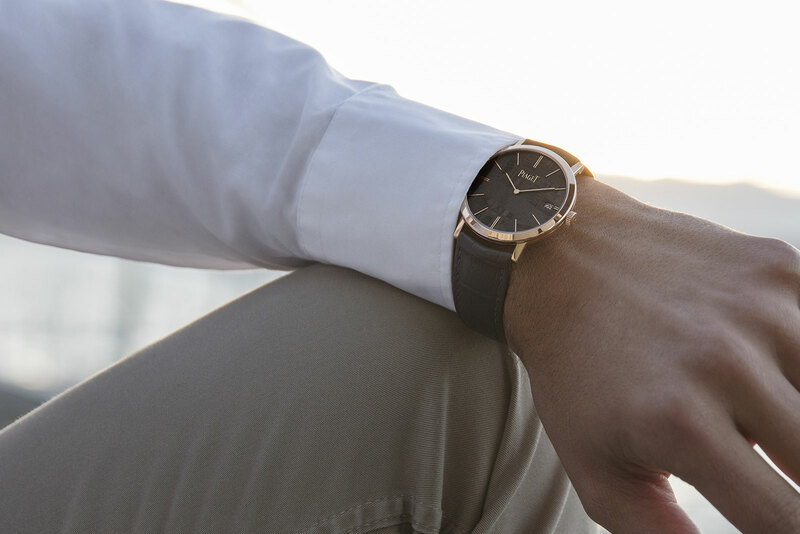 More affordable and just as elegant, the Altiplano automatic has a grey-brown meteorite dial matched with an 18k pink gold case. Unlike the printed markers on the tourbillon dial, here the hour indices are applied and made of 18k pink gold. It’s 40mm in diameter, with the cal. 1203P movement inside just 3mm high. 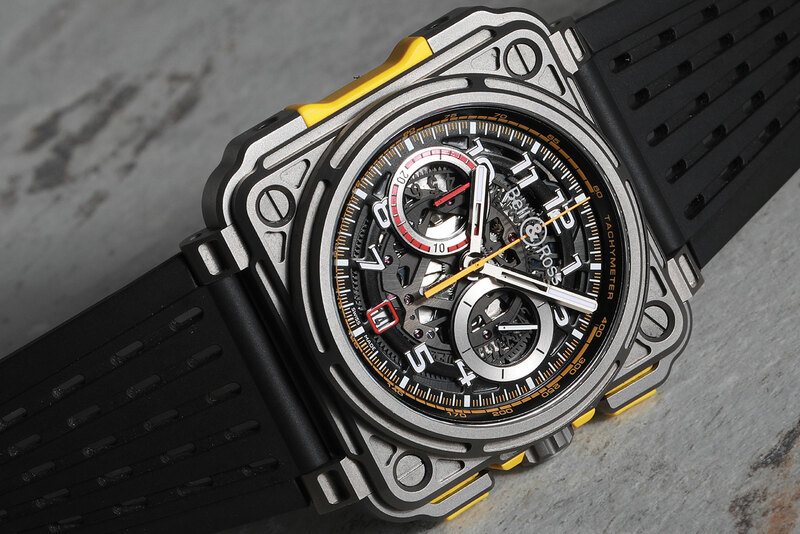 It’s an automatic wound by a micro-rotor, with a 44-hour power reserve. The dial indicates hours and minutes, and unfortunately for traditionalists, the date in a window at three o’clock, which throws off the symmetry and simplicity of the dial. The Altiplano Tourbillon with meteorite dial (ref. G0A44053) is limited to 28 pieces, priced at SFr110,000. And the Altiplano automatic with a grey meteorite dial (ref. G0A44051) is a 300-piece limited edition, priced at SFr24,500. Only 20 of the ultra-luxe satellite-sync wristwatches will be made. A pair of tourbillon wristwatches with burl wood bezels, inspired by a 1938 Bugatti coupe. A new take on Renault Formula One. 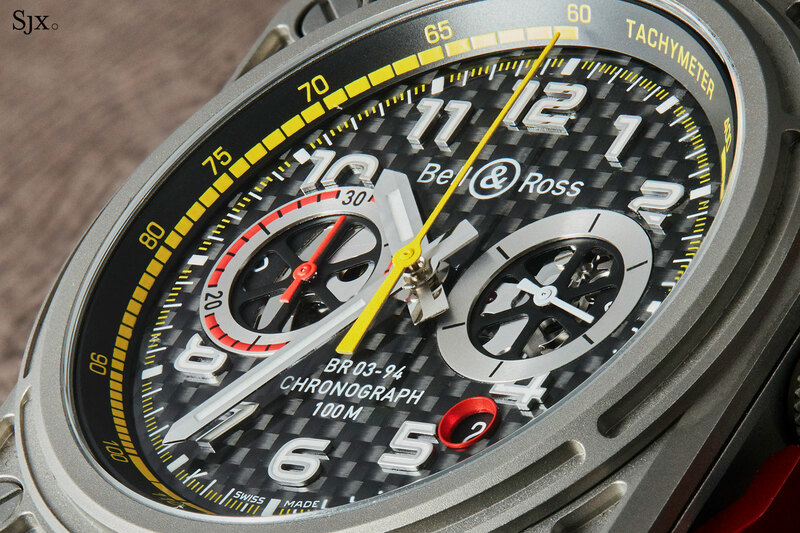 Bell & Ross marked three years of its partnership with Renault Sport Formula One with a quartet of racing chronographs. Although all four sit in different price brackets, they share the same concept and design cues. 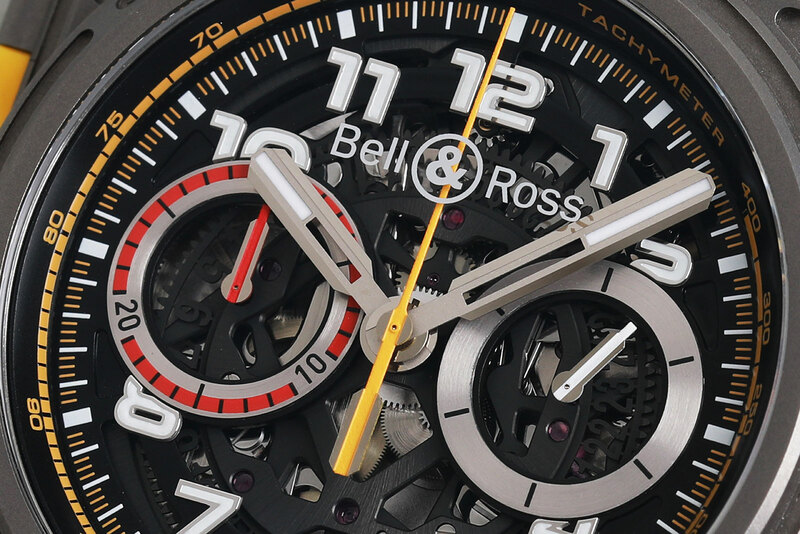 The top of the line is the tourbillon-chronograph, while the entry-level each is the round BR V2-94. And in between sit the distinctively square BR-X1 R.S.18 and BR 03-94 R.S.18. With each generation of R.S. – short for Renault Sport – Bell & Ross (B&R) has progressively advanced the styling of the line. 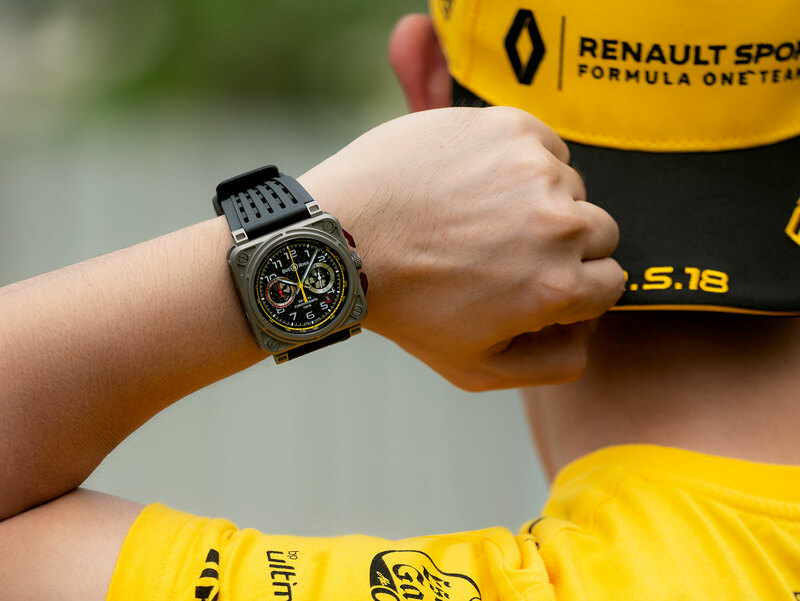 It started in 2016 with the R.S.16 watches dressed in the yellow and black livery of the Renault team. The carbon composite cases were an obvious nod to the sport, being the same material used for most of a Formula One car. The 2017 instalment of the R.S. took the Formula One inspiration further, using the ridiculously complex steering wheel – it has over 30 knobs and buttons – as the basis for the watch. That resulted in an aggressive combination of colours – the functions of the steering wheel are colour coded – making one one of the more polarising R.S designs. The R.S.18 breaks new ground for the line, as B&R dials back the use of bright colours and carbon composite in favour of good old titanium. 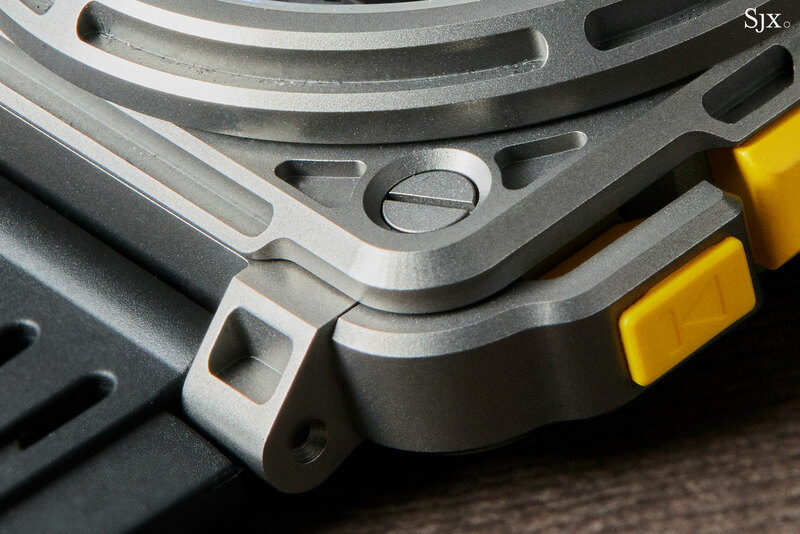 Rather than sticking with carbon composite, which is now common in watchmaking, the R.S.18 has matured enough to rely on titanium and a bit more imagination. In keeping with the perennial quest for lightness that defines Formula One, the bezel, case middle and lugs of the BR-X1 R.S.18 has been hollowed out. Granted, the weight reduction does not leave it as light as a carbon composite watch case, but the permanence of a metal case is always welcome in a luxury watch. 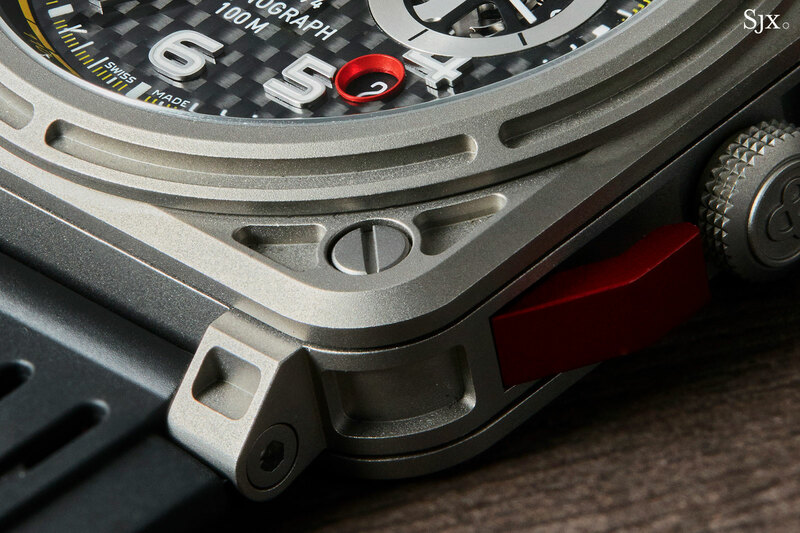 On the wrist, the 45mm, micro-blasted titanium case wears well and light despite its size. The lugs are short which greatly improves the ergonomics. While I’m usually a fan of smaller watches between 36mm and 40mm, I still enjoy the sheer presence of this timepiece, which fits its genre and purpose. 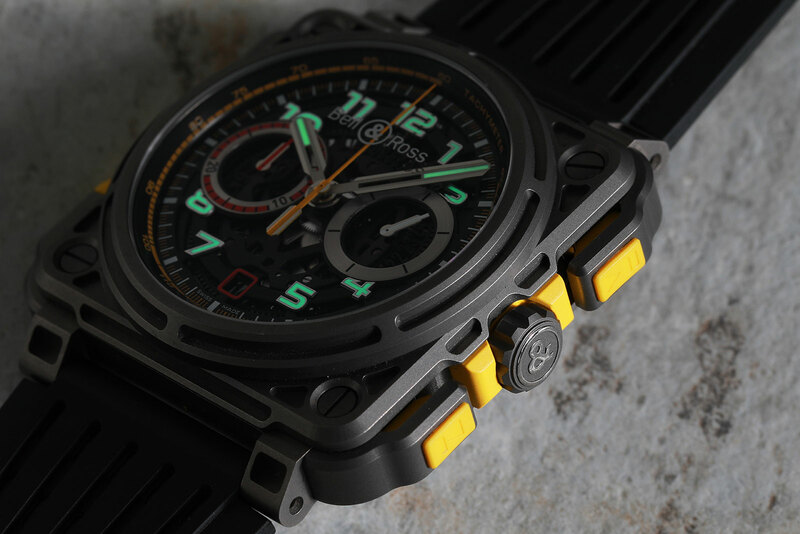 The case construction is complex and detailed, as one would expect from the BR-X1 range, which is the high-end, “experimental” line of B&R’s square watches. 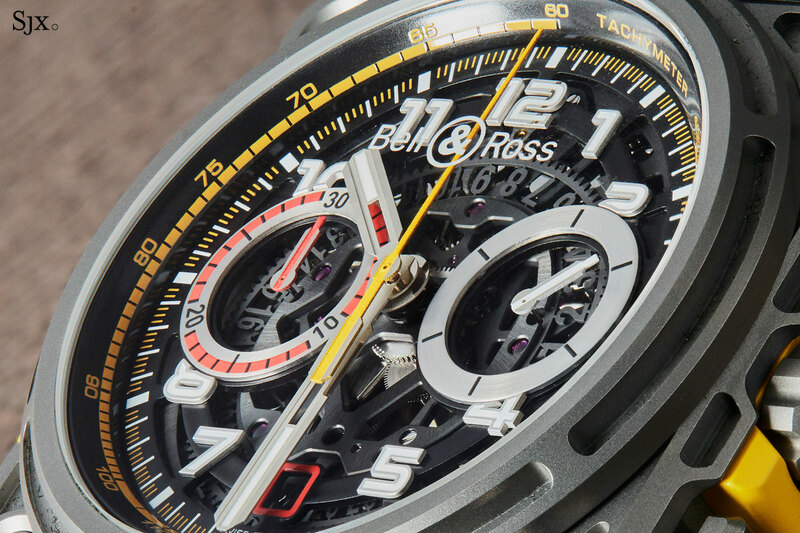 Both chronograph pushers are “rocker” style, essentially titanium levers pivoted on one end. The construction of the pushers is especially appropriate, being reminiscent of the paddle shifters in a Formula One car. The yellow rubber inserts on the pushers are embossed with the universal symbols of start, pause, and reset, cleverly indicating their function without being too obvious (with text labels for instance). And the titanium crown is screw-down and topped with the B&R logo in relief. Though the racing inspiration is still obvious, the colour palette of the watch is more restrained – a welcome evolution. 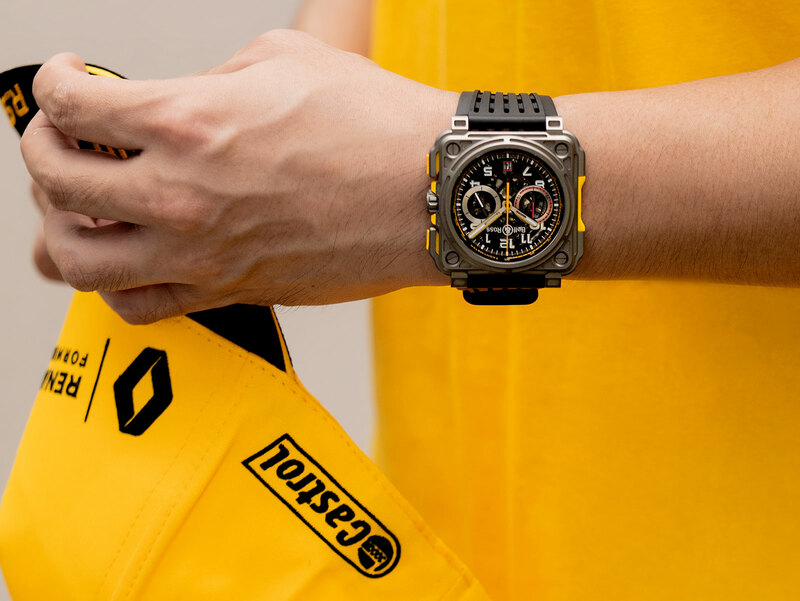 Yellow accents on the dial and rubber inserts on the case are just enough to remind you of Renault Sport. The sapphire dial has applied hour markers that are crisp and defined – with generous Super-Luminove filling – leaving the cal. BR-CAL.313 visible right below. The movement is identical to that found in other BR-X1 models, and is an ETA 2892 with a custom, skeletonised chronograph module made by Dubois-Depraz. 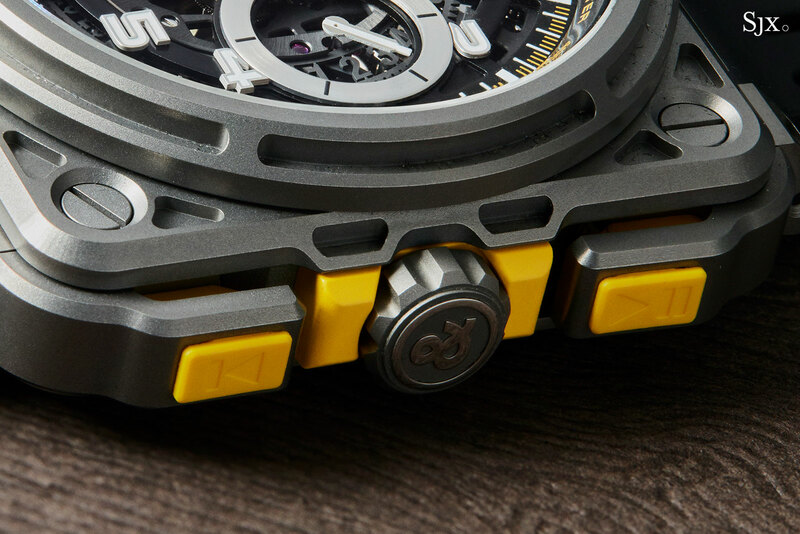 With a main plate that’s open-worked to form an “X”, the module reveals the intricacy of the chronograph mechanism, as well as the skeleton date wheel. Also new is the rubber strap, which is now perforated in a linear pattern – think of it as a twist on traditional, vented “rally” straps. If the BR-X1 R.S.18 has any shortcomings, it’s the stiff retail price of US$23,000, or S$31,500, which places it in a segment where competition is keen and the offerings diverse. Much more affordable but with almost as much Formula One inspiration is the BR 03-94 R.S.18. It sticks to the same basic formula as its pricier cousin, without going quite as extreme. Notably, the BR 03-94 R.S.18 wears slightly lighter than the BR-X1, due to its smaller 42mm case. The titanium case has the same hollowed out design, but with a less drastic execution. And the complexity of the BR 03 case is not nearly as elaborate as on the BR-X1 – it’s comprised of fewer parts – though it still retains rocker-style chronograph buttons, albeit simplified. Here the pushers made from red anodised aluminium. And the crown is press-fit, making it marginally more elementary in both design and functionality. That being said, both this and the BR-X1 have the same water-resistance rating of 100m; that’s because a screw-down crown serves more to protect the stem and tube rather than increase water-resistance. 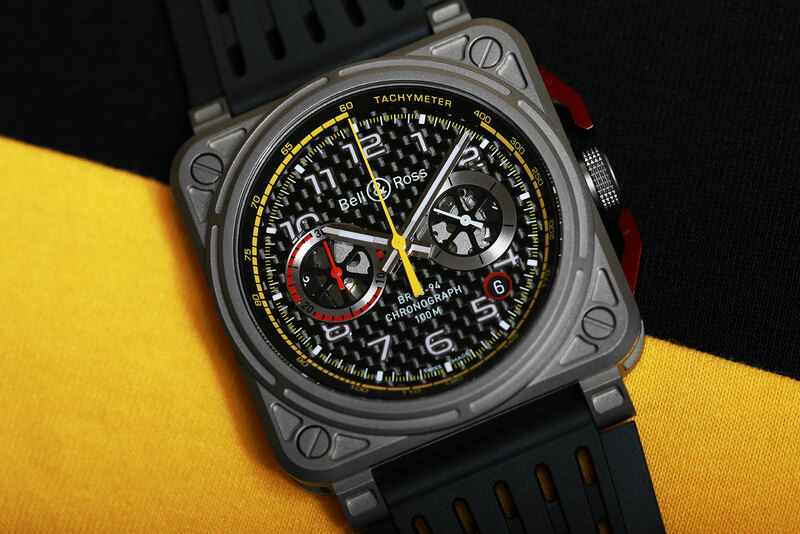 The dial of the BR 03-94 R.S.18 is typical of a racing-inspired watch, made of a carbon fibre reinforced polymer that shows the weave of the carbon, with applied numerals on top. And the hands are understandably less elaborate than those on BR-X1 R.S.18. Depth and detail is provided by the chronograph registers, which have been open-worked to reveal a bit of the mechanics. Underneath the dial is sits the BR-CAL.301, the tried and trusted, and modular, chronograph ETA 2894, a heavily simplified version of the movement in the BR-X1. The BR 03-94 R.S.18 is fitted to the same perforated rubber strap and is a limited edition of 999 pieces. More crucially, it is a third of the price of the BR-X1 R.S.18. I love the new styling of the R.S.18, which steers clear of overt and convenient racing cues. 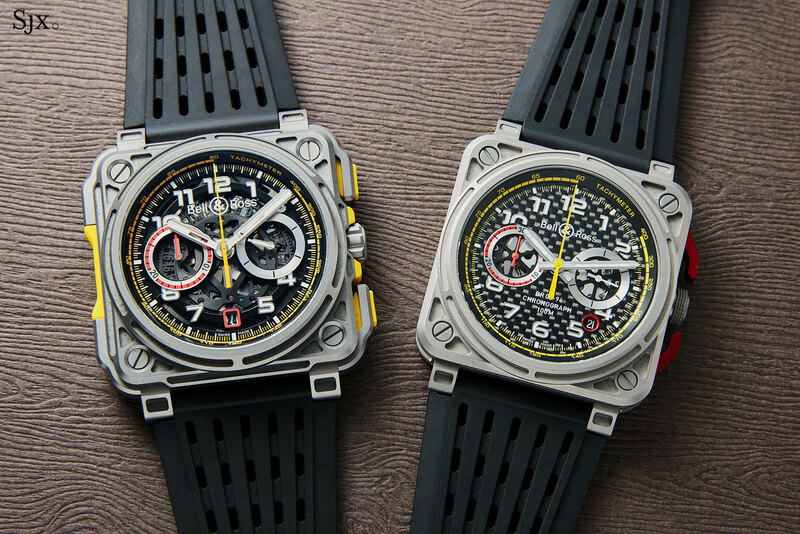 This interpretation of Formula One feels more multi-dimensional, while also managing to separate the two watches. Both are similar, yet distinctive at the same time. The BR-X1 R.S.18 is a watch that offers a lot in tangible details, more than one might typically expect from B&R. Its retail price pits the BR-X1 against the likes of the Hublot Big Bang and Audemars Piguet Royal Oak Offshore – a bare knuckles fight. In comparison, the BR 03-94 R.S.18 has less detail and depth, yet is arguably the more compelling proposition. It is not a watered down version of the fancier BR-X1, but it stands well on its own, especially when considering its relatively modest cost. The BR-X1 R.S.18 (ref. BRX1-RS18) is priced at US$23,000, or S$31,500, while the BR 03-94 R.S.18 (ref: BR0394-RS18) is US$6500, or S$9,500. For more, visit bellross.com. 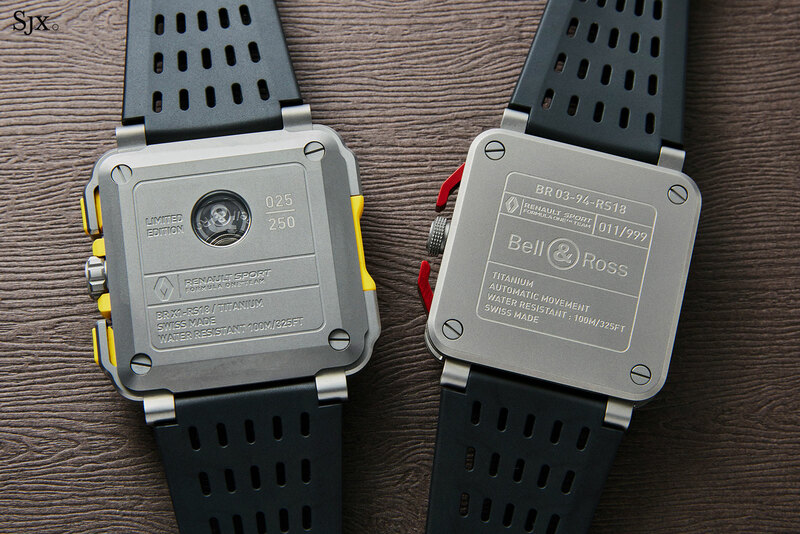 The very first Bell & Ross with a watch case in clear sapphire crystal. The matte greys and whites of private aviation.